Republican Governor-elect Elect Eric Greitens has spoken out about his choice to be the state’s Agriculture Director. He claims he selected Chris Chinn because of her skill as a farmer and a spokesperson for farmers and ranchers. 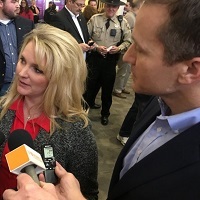 “She’s not only done this for her own family, but she’s been out fighting for Missouri farmers and ranchers for decades and I’m honored to have her as a fighter for all of Missouri’s farming and ranching families,” said Greitens. Chinn joined Greitens Tuesday at Truman State University in Kirksville. It was her first public appearance since he announced her appointment last week. Chinn has to be confirmed by the Missouri State Senate by the end of January.